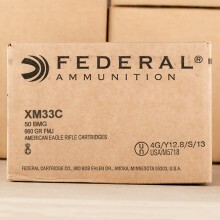 .50 BMG AMMO IN BULK SHIPS FREE FROM AMMOMAN! .50 BMG or .50 Browning Machine Gun entered service in the early 1920's and is a standard cartridge for many NATO countries, including the United States. A choice of long-range rifle shooters, snipers, and 50-caliber machine gunners, 50 BMG is among the largest calibers you'll find at AmmoMan.com. 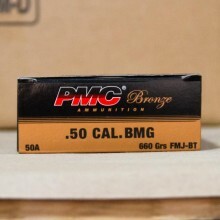 The “BMG” in 50 BMG ammo stands for “Browning Machine Gun”, the firearm for which the round was developed in the early 1900's. The round is also commonly called "50 caliber" or 50 cal by American shooters. An incredibly powerful round, 50 BMG cartridges can produce extensive muzzle energy in the 10,000 to 15,000 foot pound range. To put that into perspective, consider the 30-06 cartridge, a popular North American hunting round and the fact that it produces about 2,500 foot pounds of muzzle energy. With 50 BMG ammo, you’ll experience muzzle velocities of around 3,000 feet per second, depending upon the bullet weight you select. There are a number of different cartridge types or variants of the 50 BMG round you can find for sale in the United States. 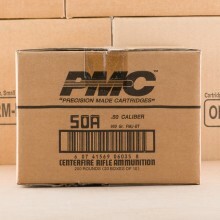 Among them, it’s not uncommon to find tracer rounds, incendiary rounds and ball or full metal jacket (FMJ) ammunition. Within the ball ammunition category there are a number of variants you can look for as well with most ball ammo used by the military for targeting personnel and unarmored vehicles. 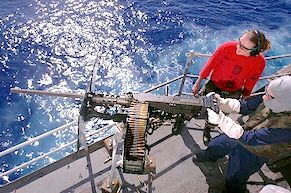 Still heavily used by NATO militaries across the planet, the U.S. Coast Guard uses 50 BMG rifles to take down armed helicopters when necessary. Additionally, a number of law enforcement agencies including the New York City Police department and Pittsburgh’s police department have adopted the 50 BMG for taking out vehicles by firing the rounds into the engine block. 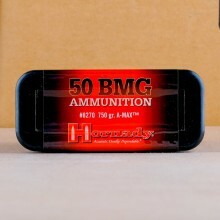 Here at AmmoMan.com, look for a nice assortment of 50 BMG ammo for sale made by some of the biggest and most respected names in the ammunition business. That includes, PMC, Federal, and others.